Boston College alumnus Ian Thomas Malone has recently published, Five College Dialogues (TouchPoint Press, 2014), a book that is a philosophic comedic treatise on college life. According to the publisher: George Tecce, a graduate student working as a teaching assistant in the English department, his students, and his mentor examine the state of post-millennial academia. Malone was interviewed last month by the Greenwich Free Press. 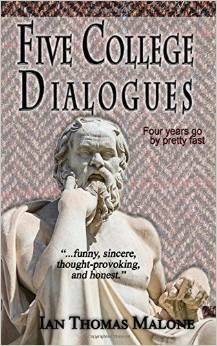 According to Malone, a sequel to Five College Dialogues is already in the works and scheduled for publication in Spring 2015. This entry was posted in Alumni Authors and tagged college, humor. Bookmark the permalink.